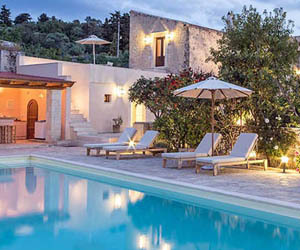 Elia is a 200-year-old farm estate converted into a charming guesthouse with wonderful gardens, a large swimming pool and a small spa. 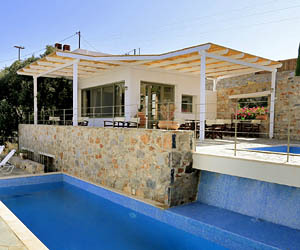 It sits all by itself amidst olive groves and fruit trees in the hills of Western Crete. 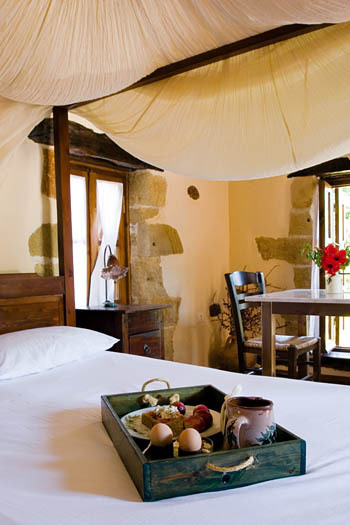 The setting is rural and ever so quiet, with the sea only a ten-minute drive away. Sounds good, no? It gets even better. 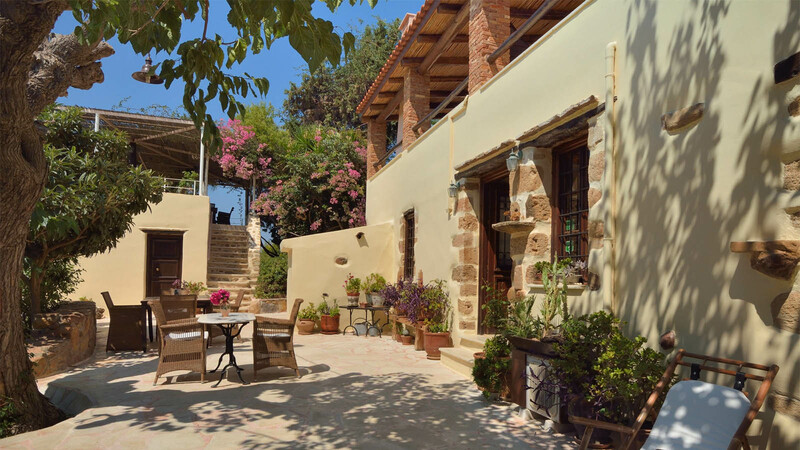 Owner George Digardakis, his wife Eftichia and their friendly staff will do everything they can to make you feel at home, serving a traditional Cretan breakfast in the morning and home-cooked dinners at night. 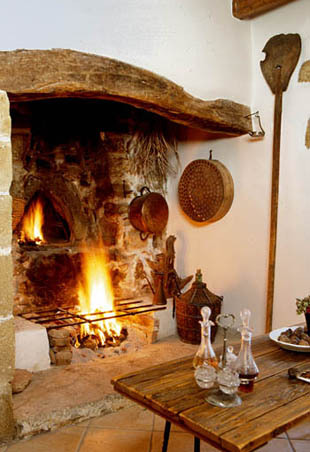 When George restored the farmhouse – it’s an old family property – he was very careful not to compromise on its character and indeed everything has kept a lovely, traditional, country feel. 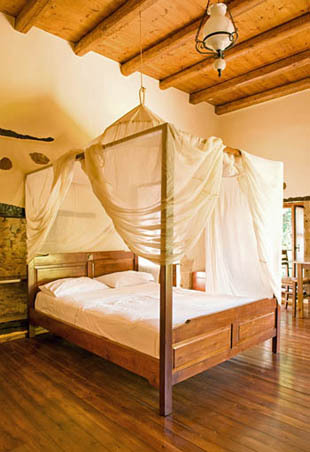 You will sleep in a room that offers the perfect combination of warm traditional aesthetics and great comfort. 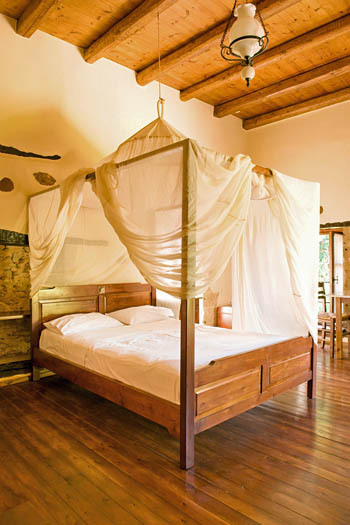 Even the lightest sleepers will have a solid night’s rest here: the mattresses are just perfect and the silence is complete. 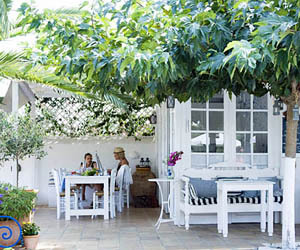 Days can be spent by the swimming pool or in the flower-filled gardens and on the terraces with their many little corners shaded by fruit trees, just chilling out with a book. 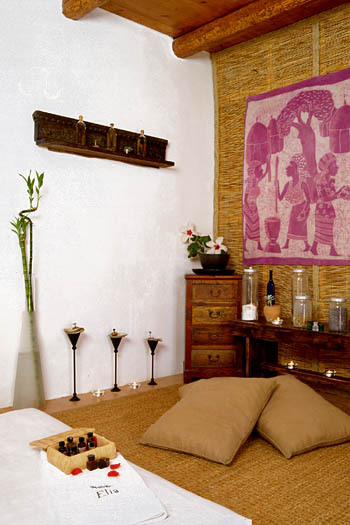 Should you feel that that is not spoiling enough for your holidays, you can indulge in a spa & wellness treatment. 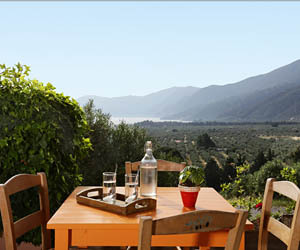 And if swimming some laps in the pool is not enough exercise, then walk the trails through the hills and olive groves. Elia has a wonderful soothing, quiet atmosphere. 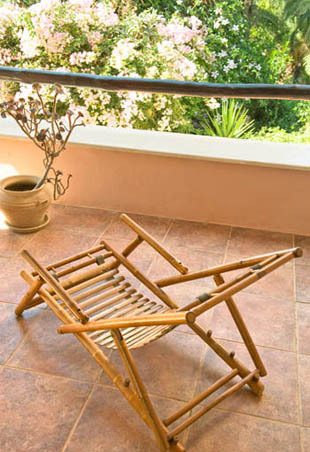 Perfect for relaxing holidays. 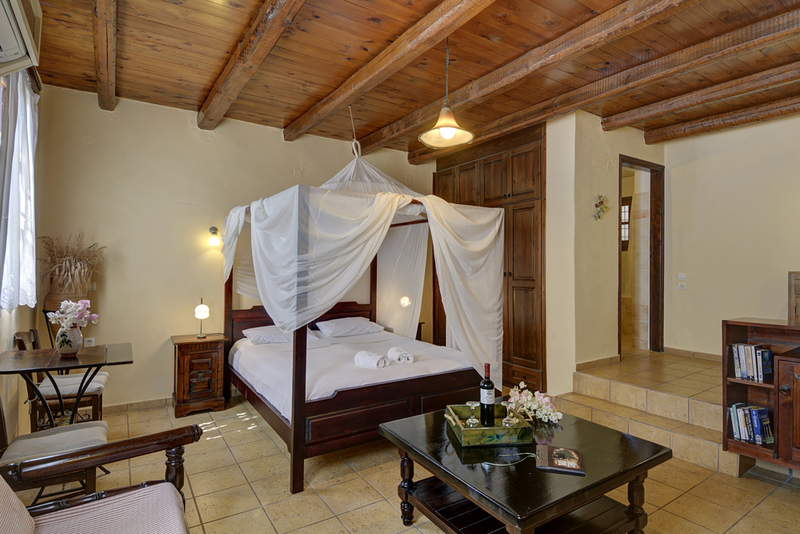 Add to that the charm and comfort of the rooms, the setting in beautiful countryside, the home-cooked meals, the warm welcome, the spa, the large pool, and I think you know enough! You absolutely need a car to go around, not just to go the beach, to go anywhere really. 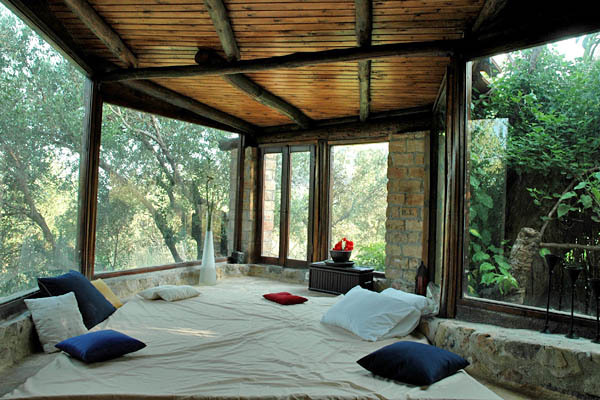 This is the nicest room! This picture was taken some time ago. I wonder how high these cactus plants are by now! 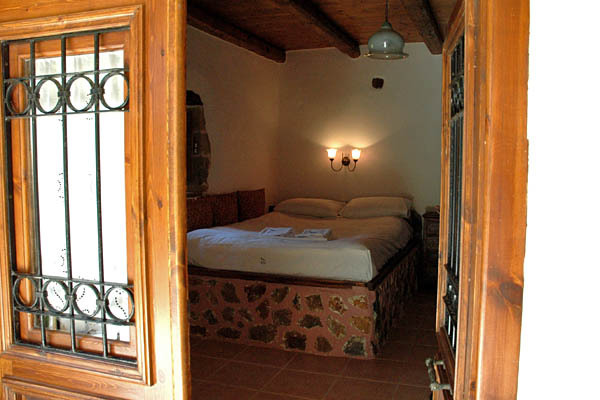 Prices for two persons from 106 Euro per night, breakfast and taxes included. 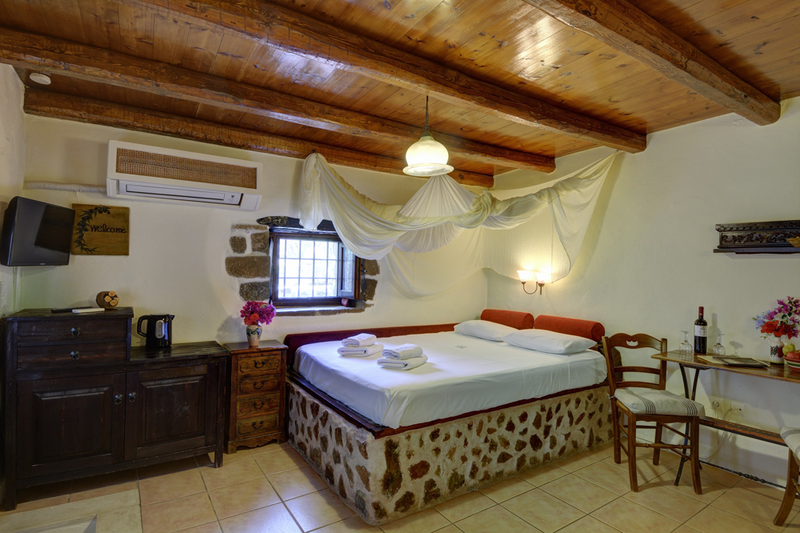 For a full overview of room rates, please check the website of Elia or contact George for special rates and quotes. 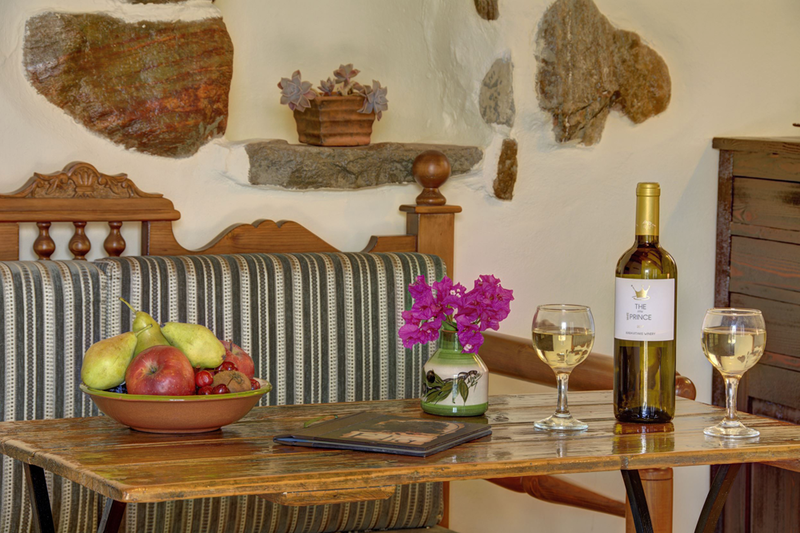 A traditional Cretan breakfast is served in the restaurant, as late (or early) as you’d like. For lunch you can order some light dishes like salads, sandwiches and typical Cretan dakos (crunchy rye bread with chopped tomatoes, feta cheese, topped with oregano and olive oil). For dinner you can have excellent home-cooked meals, but you have to order it in the morning. 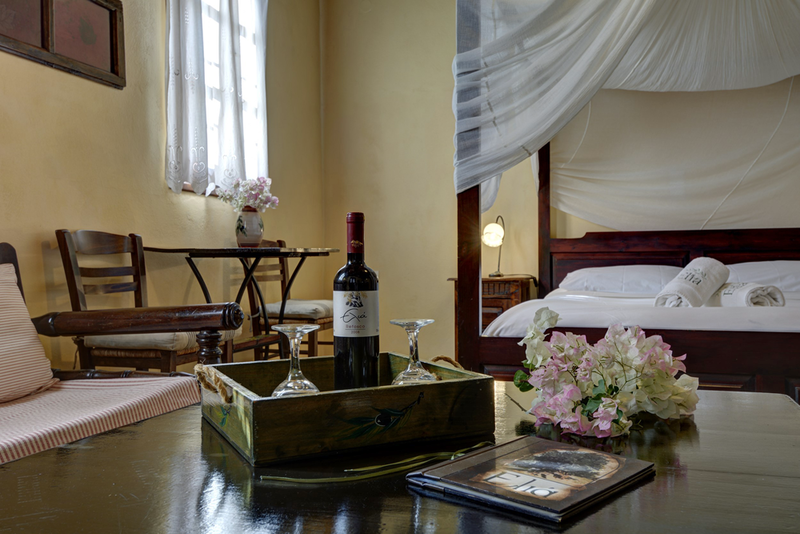 If on your day of arrival you’d like to have dinner at the guesthouse, it is best to get in touch a day in advance to let them know (though usually they will make sure there’s dinner for arriving guests anyway). Some people are worried that their children may get bored during their holidays when staying in a guesthouse where you cannot walk to the beach or to the ice cream vendor. 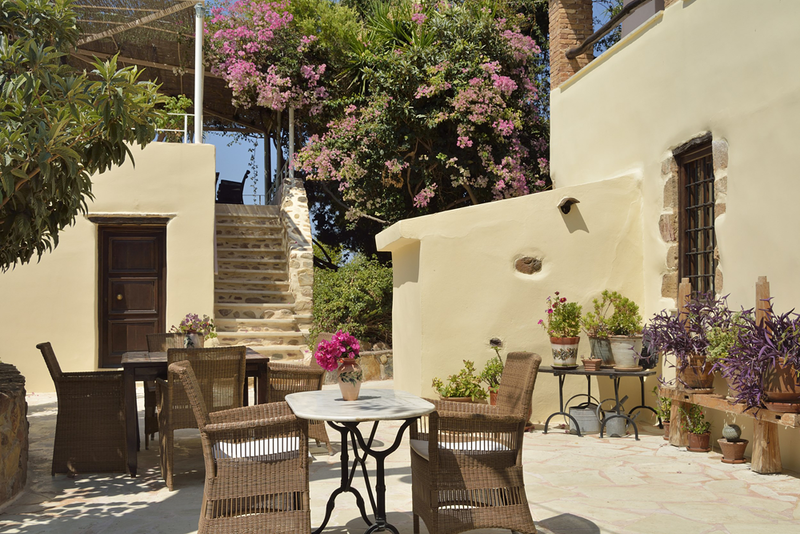 Maybe teenagers would prefer to be a little closer to the action indeed, but for younger children, Elia is just one big playground, with so many centuries-old olive trees to climb and ‘secret’ little places to hide. They will have a great time. There are a few family rooms and cots are available. Dive into the large pool and do your laps. Or go to the sea. The northern coast, lined with long stretches of mixed sand/pebble beach, is barely 15 minutes by car. A bit more driving takes you to some of the best beaches in Greece. The stunning lagoon of Balos NW of Kissamos is less than an hour’s drive away, while you need 1.5 hours to get to famous Elafonissi on the SE coast. Fame comes at a price, and both beaches do attract crowds in the summer. But many come on organised bus or boat excursions and you can avoid them by coming early morning or late afternoon. Also, if from Elafonissi you drive on a few km, you will find the smaller but beautiful beaches of Kedrodasos and Agios Ioannis, which are always a lot quieter and where clothing is optional. 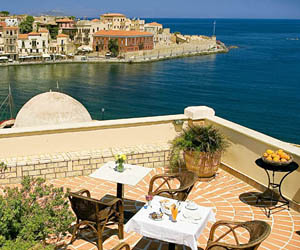 Spend a day and evening in the old town and the Venetian harbour of Chania. Shop for souvenirs, fashion, arts and crafts in the narrow pedestrian streets. Check out the Hassan Pascha Mosque, now used for art exhibition and craft fairs. 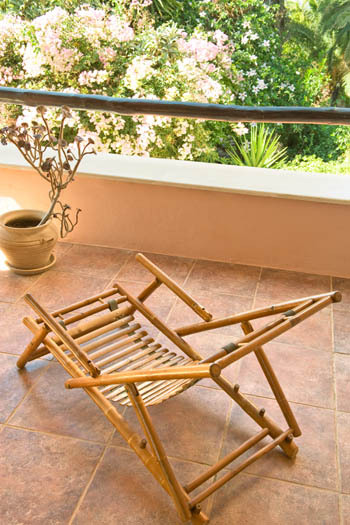 Visit the Archaeological Museum of Chania and the Maritime Museum of Crete. 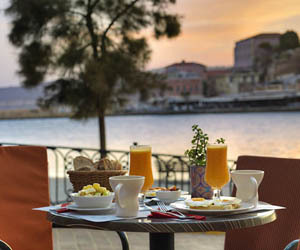 Have a drink by the water, and pick one of the cosier restaurants in the backstreets for dinner. 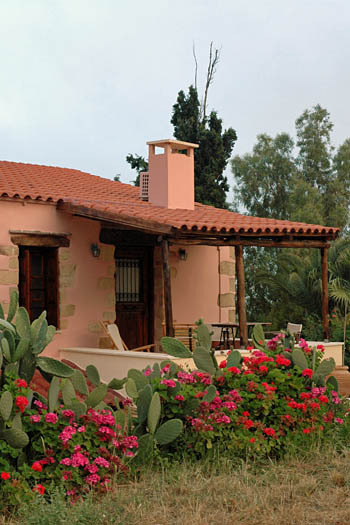 Go and see the Botanical Park & Gardens of Crete near Fournes (just over half an hour by car). 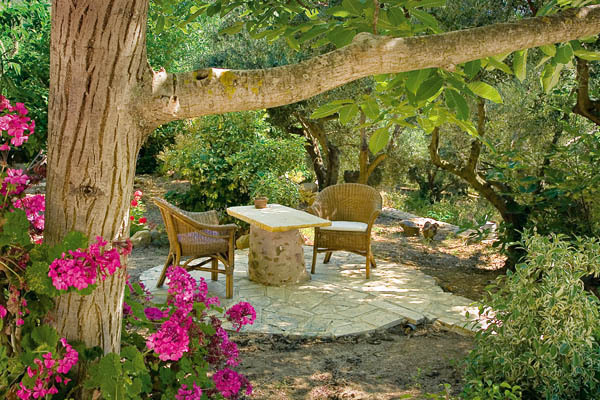 A slice of heaven (created, actually, on land that was destroyed by wildfires) with Mediterranean fruit trees, herbal gardens, beautiful flowers and tropical plants, alive with birds and butterflies. 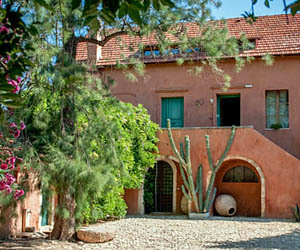 Head for the Deres Horse Riding Cente (14 km from the hotel) to ride happy well-cared-for ponies and horses. In case only part of the family feels like riding, hiking and archery are also on offer, and you can even sign up for cooking lessons. Go and visit the beautiful Olive Oil Museum of Vouves, featuring a treasure trove of old and antique tools used in the traditional olive oil production. 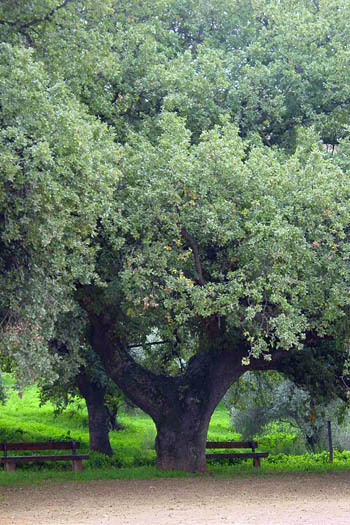 And of course, go and admire the oldest olive tree in the world, situated right next to the museum. 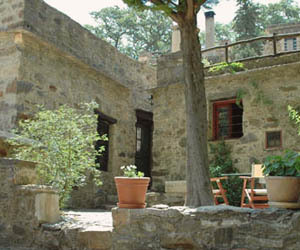 Close to Astrikas (about 10 km) visit the Biolea Estate where organic olive oil is produced using traditional millstones for a tour and olive oil tasting. 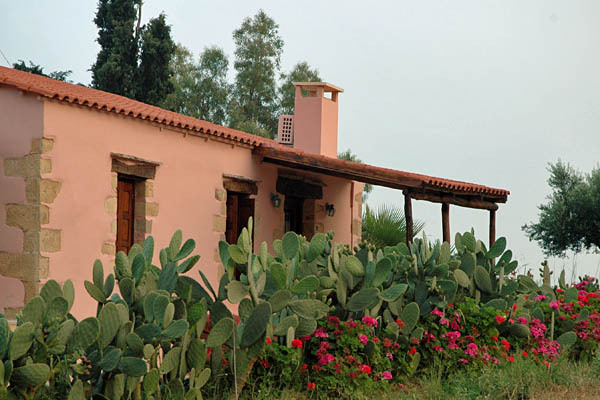 Bring your hiking boots and explore hills, olive groves and rural villages on foot. The area is really wonderful for walking. There are some hikes through gorges that are not to be missed. The Rokka Gorge (between the villages or Deliana and Rokka) and the gorge of Vavouledo (starting near the village of Chamalevri) are relatively close, and not too difficult. You should count 2-3 hours to cross them. Also, of course, there is the 16 km hike through the famous Samaria Gorge (best to go with a guide with an organised transfer back to the starting point). And there are others, such as the Agia Irini Gorge (7.5 km from Agia Irini to Sougia) and the gorge of Imbros (8 km from Imbros to Komitades). 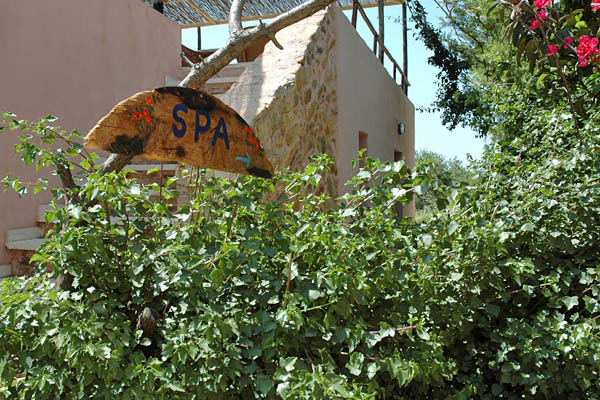 Back at Elia, treat yourself to a massage, aromatherapy or a body mask, or relax in the Jacuzzi with essential oils, seaweed aloe juice or infusion from olive leaves (and more). 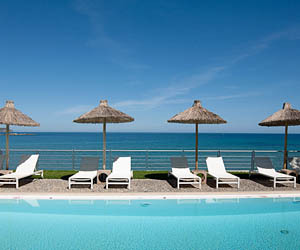 You can also sign up for one to five-day spa programmes, and there’s yoga, shiatsu and reiki. 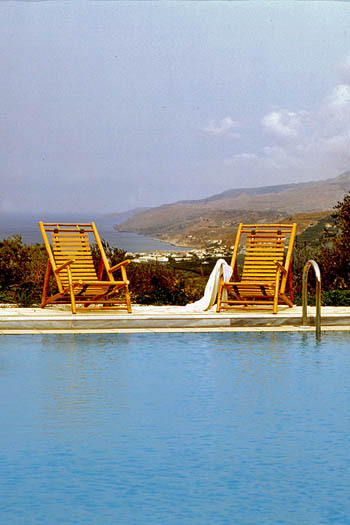 Elia is situated in the midst of a 15-acre olive and fruit tree estate in the hills of western Crete, 25 km west of Chania. There’s a small village about 5-10 minutes’ walk away. 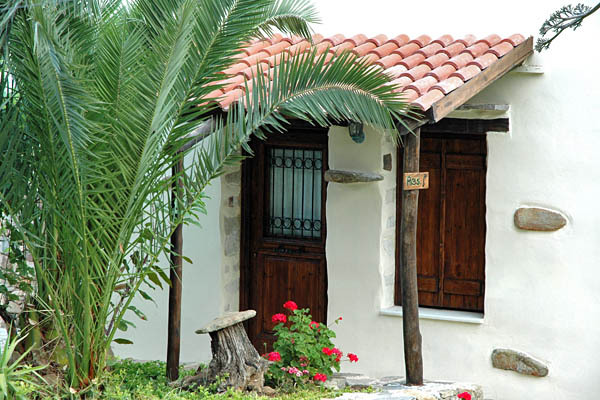 The sea (as well as beaches, restaurants and shops) are about 6 km from the guesthouse. Take the exit for Kolymbari and Spilia from the national road between Chania and Kissamos, and turn left towards Spilia. Pass through Spilia and Kato Vouves following signs for Ano Vouves. Turn left as you enter Ano Vouves (don’t go up the hill) and bear left after passing some houses. After about 500 m you will see a sign on your left for Elia. Jo and her staff are great hosts. In house dinner was delicious.